Once again the academic year has flown by and we find ourselves now at the very end of the summer term. Looking back at the year, we can do so with immense pride; we have achieved a great deal, not only in what we have made, but also the special events we have hosted. Receiving all of the remains of P9503 in December was a particular highlight, and has spawned a spur to the project; I now run an extra lunchtime club on Mondays called Aviation Archaeology specifically to go through the finds, clean them up, catalogue them and see what parts can be used within our build. We have made many new friends too, and of course new students have joined the project. The summer term is traditionally a quieter term for us, as so many students are so heavily involved in exams as well as other activities. I look forward to September when we start all over again, and, we must not forget, celebrate the last big anniversary of the Battle of Britain. We have almost completed the rough cutting out of the frames for the fuselage now. When we get our Hangar/Education Centre built we will be able to fit them to the jig and start final assembly, but until then each frame still needs the lightening holes ‘pressed in’ with the router bit, and any final lightening holes added. For many I have chosen to leave the datum longeron uncut at the moment, as we know it’s dimension, and it is critical that the datum lines up perfectly first; it would not be good to have one or more frames out by a small amount because of a mistake with the longeron aperture too early…control freak? maybe, but better safe than sorry too. 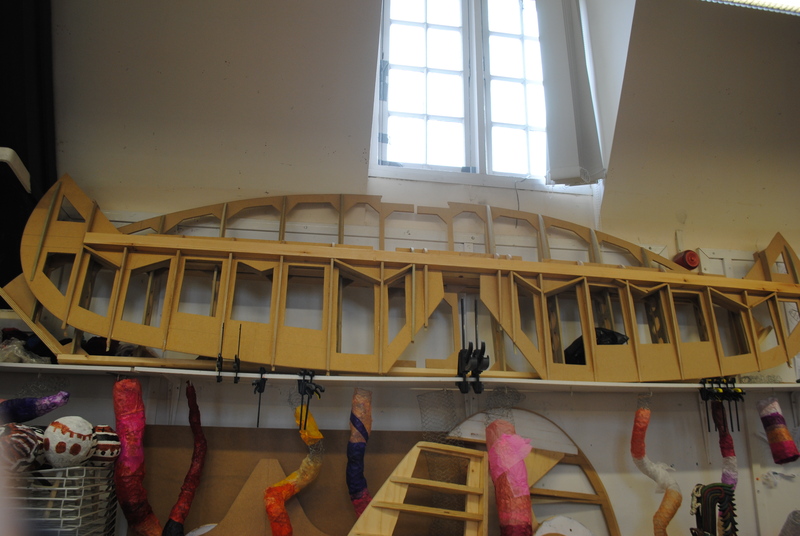 Much work continues to go into the tail, in particular the elevator and stabiliser. Hinges, spar shaping, and profiling have all taken their share of the time recently. 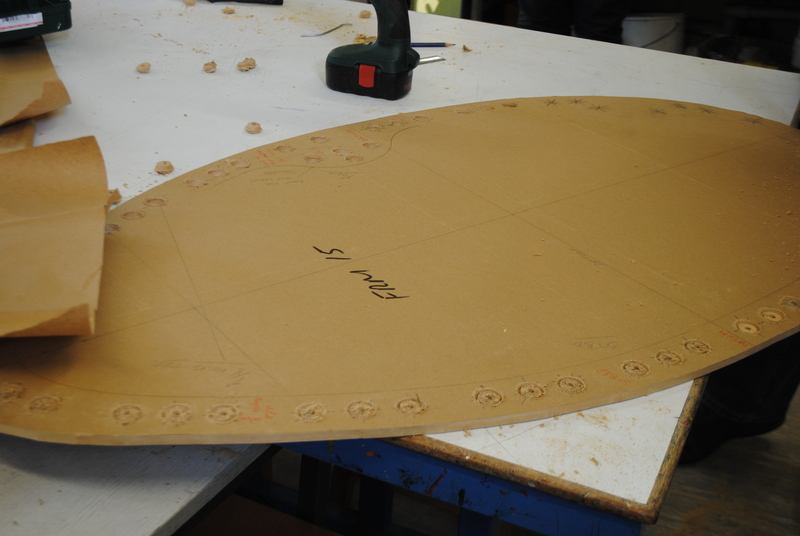 Having started skinning the lower section of the tail itself, it was decided to leave this until we can fit everything together on the jig to ensure that all measurements come from the datum line, so that job is also awaiting the hangar build. I have appointed a senior student to lead the simulator build; he is a Maths and Physics student and hopes to become an aeronautical engineer. He has secured work experience with Lufthansa over the summer break, so may well come back with new ideas! As we progress through the construction of the frames for the fuselage, we are making doubles of those in the cockpit area, (frames 5-14.) This means that we only need to problem solve once, but end up with a second cockpit that will become our floor-mounted simulator. There may be some alterations that we will make to it, although some aspects are yet to be fully finalised. I anticipate possibly utilising a flat floor, with discrete trolley wheels on it to allow ease of manoeuvrability. It will however, still be built authentically, including all interior detailing as the sense of being in a real Spitfire is as important for the simulator as it is for P9503. It is hoped that when complete, the simulator will have working gauges and switches, all interfaced with the software so that realism will be at the forefront. We are also exploring the possibility of building a motion platform to add to the 4D experience. I have made contact with a number of companies who provide equipment for the flight simulator sector, and some have offered to make donations towards our simulator. Any support of our project, in whatever form, is always hugely appreciated, and I hope to be able to expand on what these donations are in Bulletin 10. Some of the biggest outlays for a successful simulator are the computer(s) and monitors. If you would like to contribute in any way to this aspect of the project, please do get in touch, it is, like everything we do, very ambitious and will only succeed through the generosity of others. passed away over the weekend of 9th and 10th May this year. George was a guest of honour at the presentation event last December, and I very much enjoyed being able to spend more time with him on the day. He was always so enthusiastic, not just about the project, but about life. 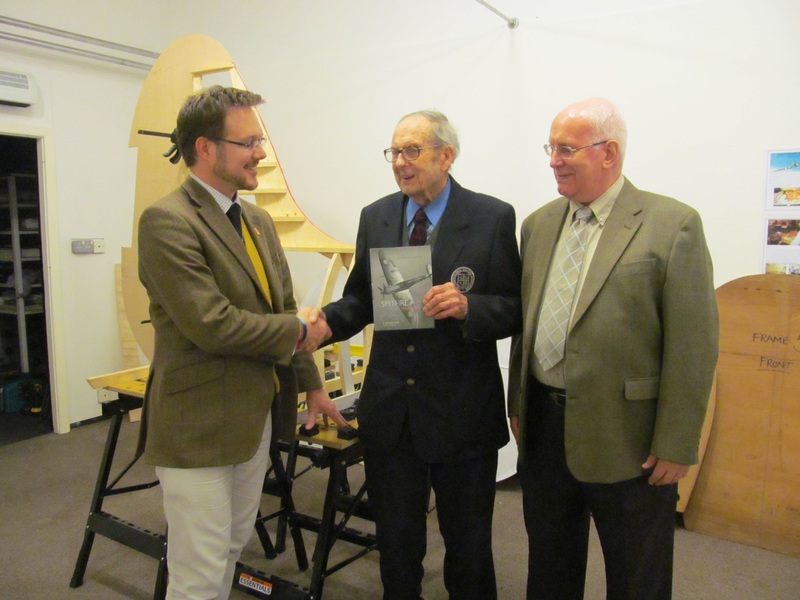 Part of his contribution to The Ratcliffe Spitfire project was as one of the last living links to Paul Baillon; now that has gone, but those of us fortunate enough to have met George will always carry that link with us. I have had a number of companies very kindly draw up proposals for our Education Centre. They are all viable options, and architecturally attractive too. However, nothing can happen until we can fund the project. We need to raise approximately £150,000, so this will become somewhat of a priority in September when we will be launching a special appeal for the build. The end result will be a venue suitable to showcase this unique project, to form a museum to Ratcliffe College’s aviation heritage, Ratcliffe Aerodrome, the ATA’s involvement when it was No.6 Ferry Pool, and to display the recovered remains of P9503 as well as other Spitfire and aircraft parts. 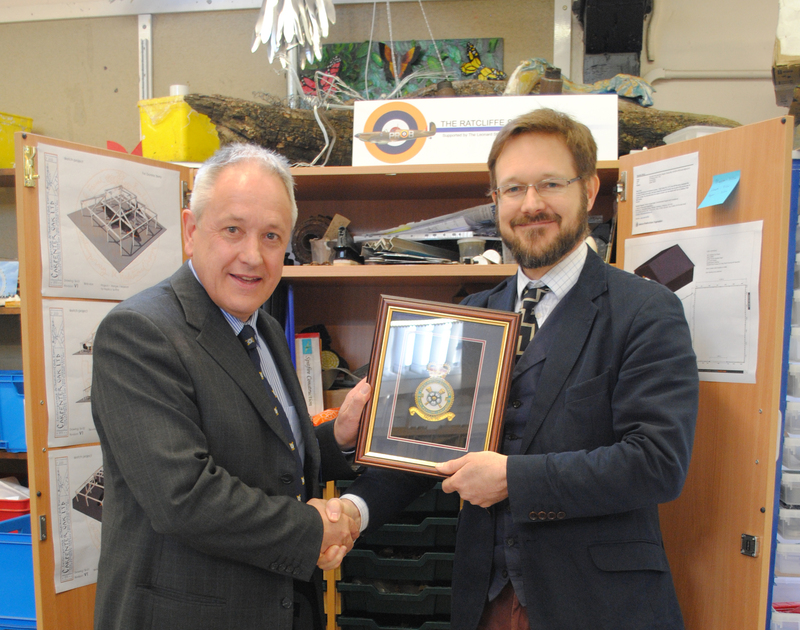 I have known the CO of 609 Sqn, Sqn Ldr Jeff Metcalf for some years, but had never met him in person until 23rd April when he came to visit the project in person. (609 Sqn is our squadron, being the one Paul Baillon flew with during the Battle of Britain). Jeff is passionate about history, he leads military as well as civilian trips to the battlefields of Normandy and the WWI sites in Belgium, but, as you might expect, has a loyal interest in the history of his own, famous, squadron. He brought a great deal of very interesting and valuable documentation with him, which I was able to make copies of, including the Squadron Operations Record Book for the months of Aug, Sept, Oct, Nov and Dec 1940. He was extremely interested in the progress of the build and in particular the remains of P9503 which we looked through together for quite some time. Jeff has many contacts which he is going to get hold of and see what help they might be able to provide us with. This may lead to some exciting opportunities for our students as well.